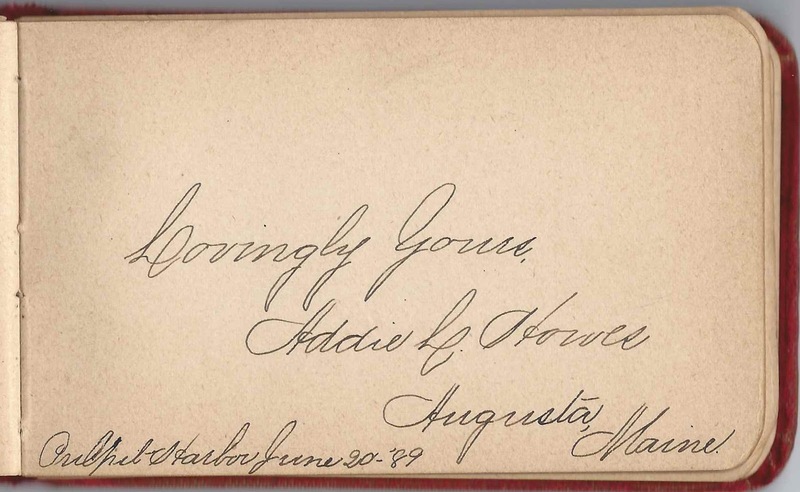 This is an unusual album in that the pages contains entries from the 1880s and 1890, with even more just from the year 1954, as if the album was rediscovered in 1954 and offered up again for inscriptions, presumably by its original owner. The contrast in entries is interesting. The later entries sparkle with the signers' regard for the album owner, Elizabeth Bean (Calderwood) Carter, also known as "Lizzie", "Nanny Carter" and "Aunt Tute". Whether she was the original owner of the album or not, I don't know, but it seems likely. See images of the entire album at the end of this post. The inside front cover used to have a newspaper clipping pinned to it. 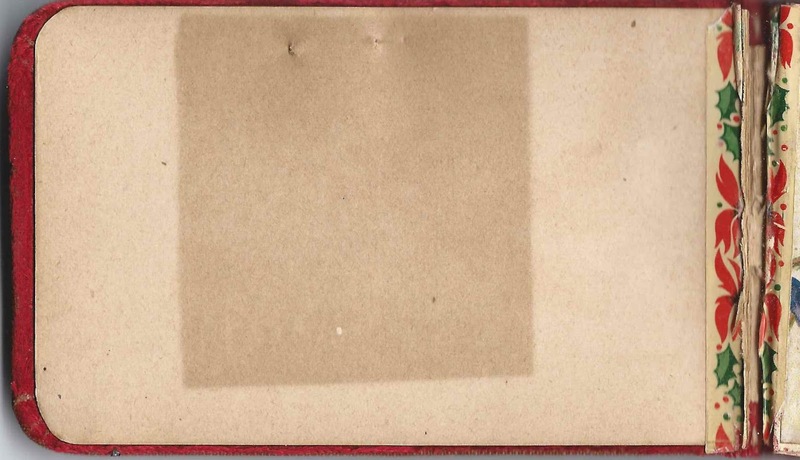 As it turns out, there is a clipping inside the album that fits the dimensions of the stain mark perfectly and has a couple pin holes, so I imagine this was the clipping that was so dear to the album owner's heart. 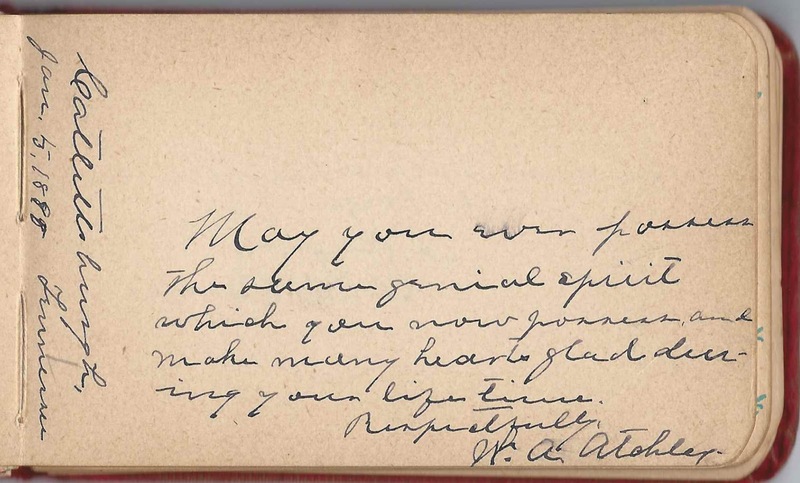 The album measures approximately 5-1/2" x 3-1/4" and contains the sentiments of over 60 people. An alphabetical list of the signers appears at the end of this post. Elizabeth Bean Calderwood, "Lizzie", "Nanny Carter" and "Aunt Tute", was born 9 June 1872 at North Haven, Maine, the daughter of Benjamin Crabtree Calderwood and Phoebe Jane (Pettee) Calderwood. Lizzie was raised on North Haven Island. Even though it's one of the later entries, where I have some privacy concerns, I couldn't resist showing you this endearing page penned by Lizzie's younger sister, Lena Bell (Calderwood) Ring. 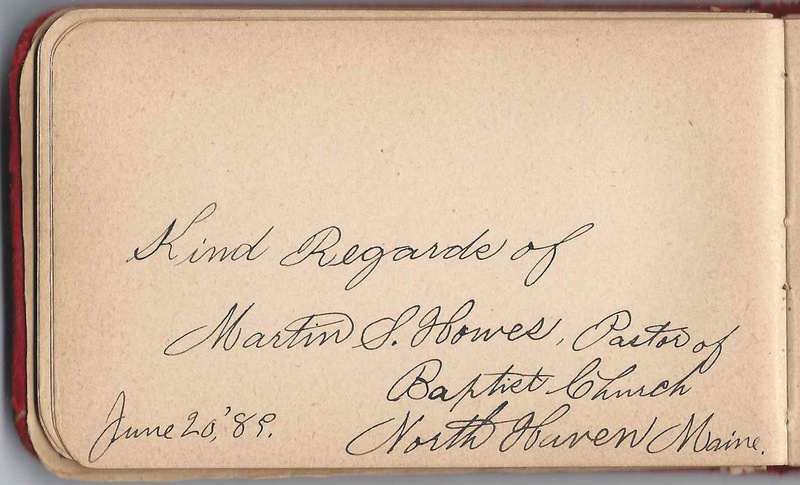 Martin S. Howes, pastor of the Baptist Church at North Haven Island, signed a page on June 20, 1885. 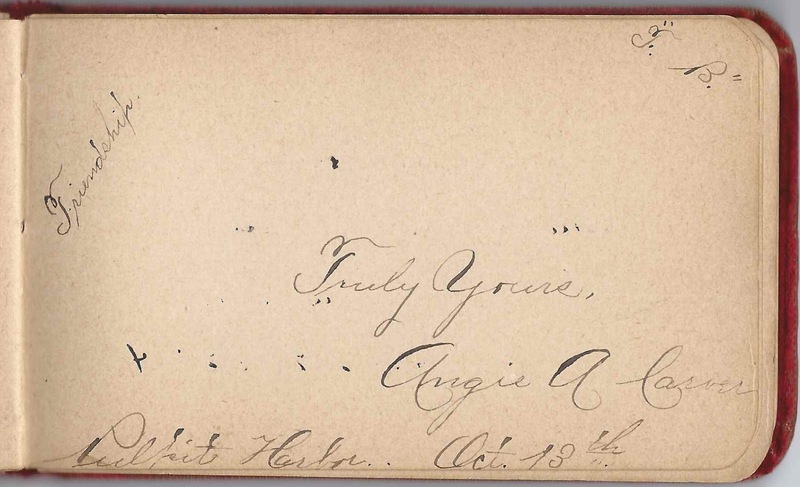 Addie L. Howes of Augusta, Maine, signed a page at Pulpit Harbor on June 20, 1889. 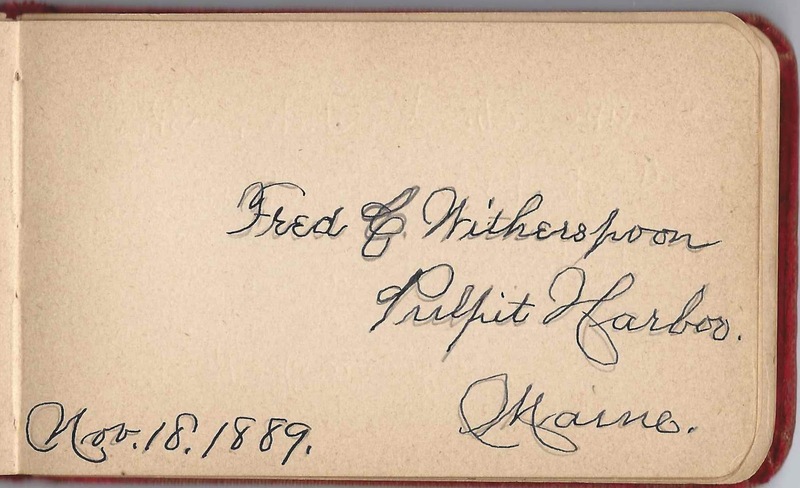 Fred C. Witherspoon of Pulpit Harbor, Maine, signed a page on November 18, 1889. According to the Thurston Genealogies, Fred Carrol Witherspoon was born 26 December 1880 at Pulpit Harbor, the son of James Carrol Witherspoon and Zoe Georgietta (Young) Witherspoon. In 1874, in what must have been an unusually cold year, Fred's parents and his mother's uncle, William Thurston of Rockport, walked across the ice to the mainland, a distance of twenty miles. "Etta" was the first woman known to do so. 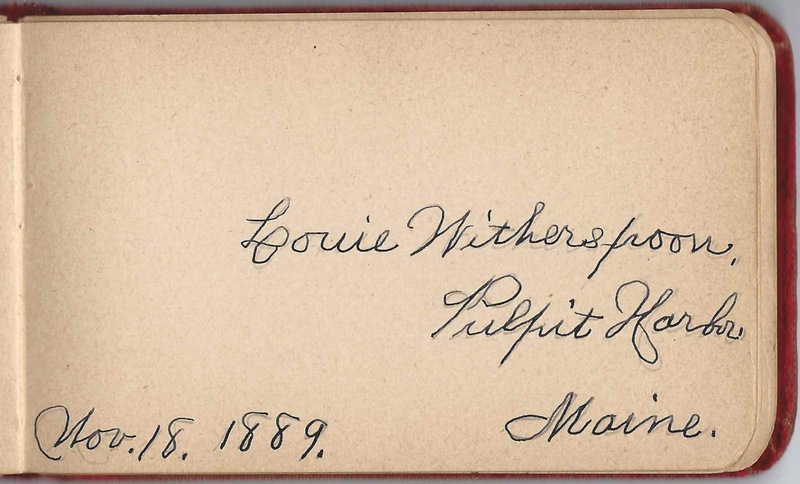 Louie Witherspoon of Pulpit Harbor also signed a page on November 18, 1889. 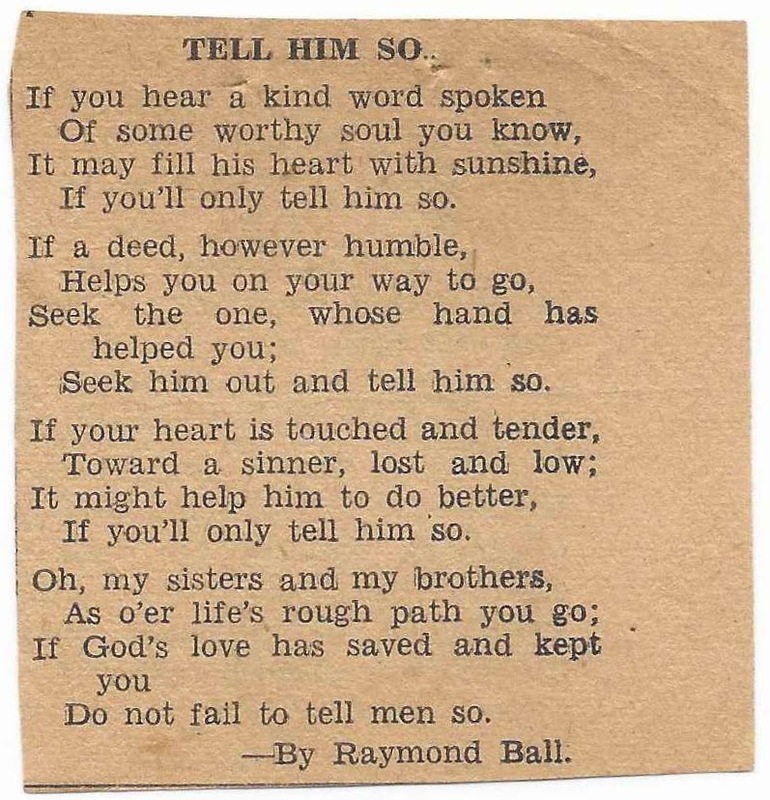 The signer may have been Fred's older sister Lunetta Frances Witherspoon. She was born November 24, 1875. Angie A. Carver signed at page at Pulpit Harbor on October 13. She didn't specify a year, but she was one of the earlier signers. 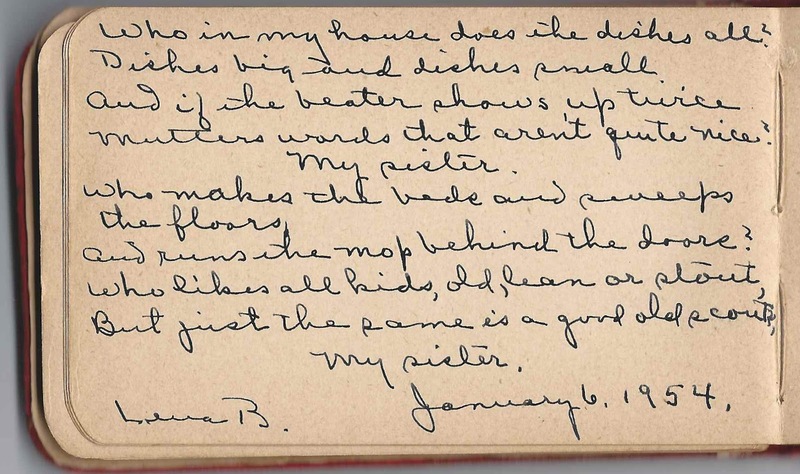 Interestingly, in 1954 Angie's married daughter found the left facing page to Angie's open, and signed it herself, mentioning that she was Angie's daughter. Angie married Allen V. Sawyer of North Haven in 1893, and their daughter would be born after they moved to Bath, Maine. 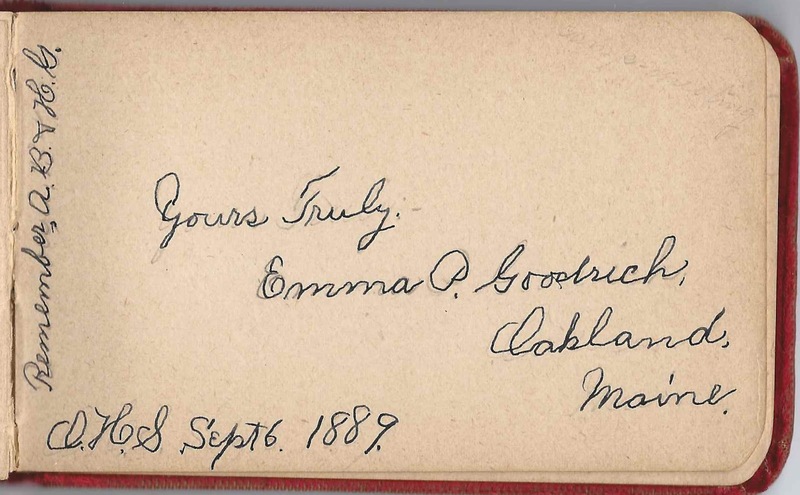 Emma P. Goodrich of Oakland, Maine, signed a page at Oakland High School on September 6, 1889. Was Elizabeth Bean Calderwood perhaps a teacher at Oakland for a time? 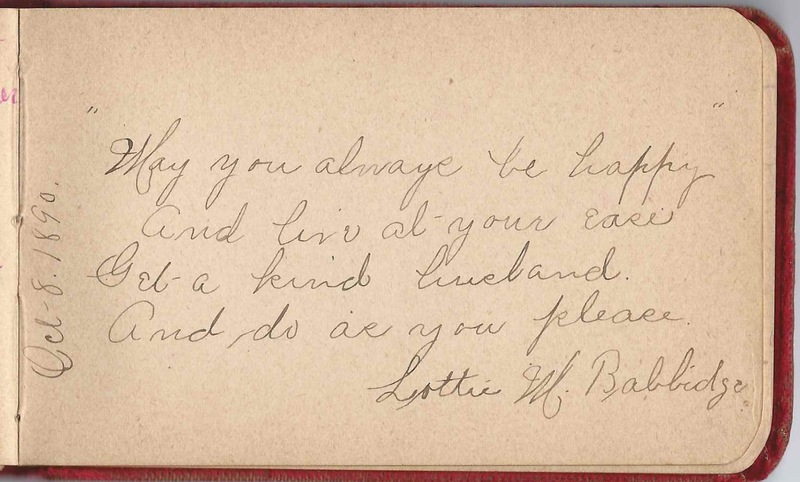 Lottie M. Babbidge signed a page on October 8, 1890. 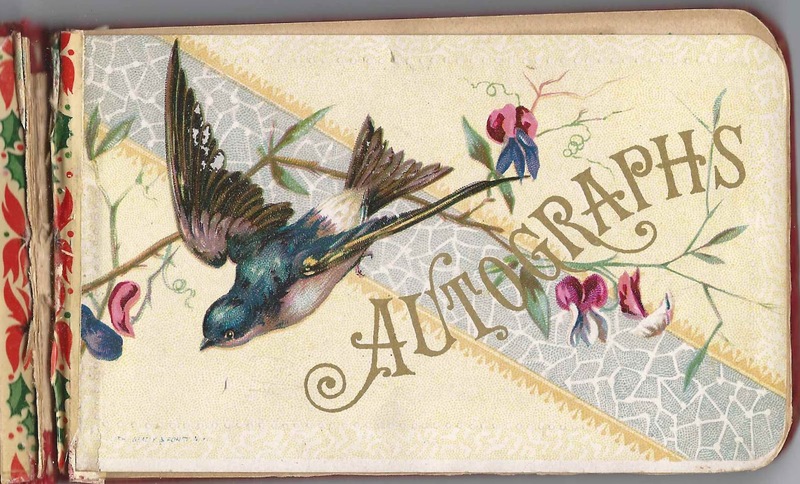 W. A. Atchley of Catlettsburg, Tennessee inscribed a page on January 5, 1888. Although undated, I believe the page below, beautifully sketched by B. F. Bickum of Haverhill, Massachusetts, was from the earlier era of the autographs. 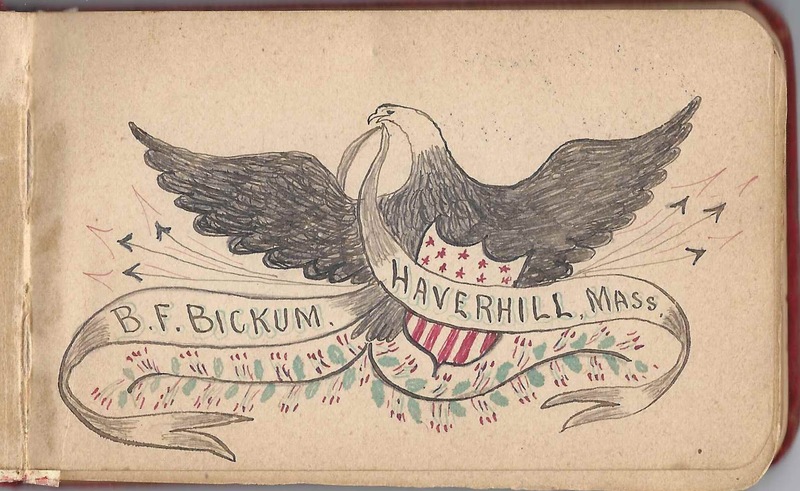 There was a Benjamin Franklin Bickum of Haverhill, who was born in 1843 and died in 1914. On 25 November 1897 at Rockland, Maine, Lizzie married widower George A. Carter, son of Joseph O. Carter and Rosanna (Burrows or Burroughs) Carter. George was a butcher. 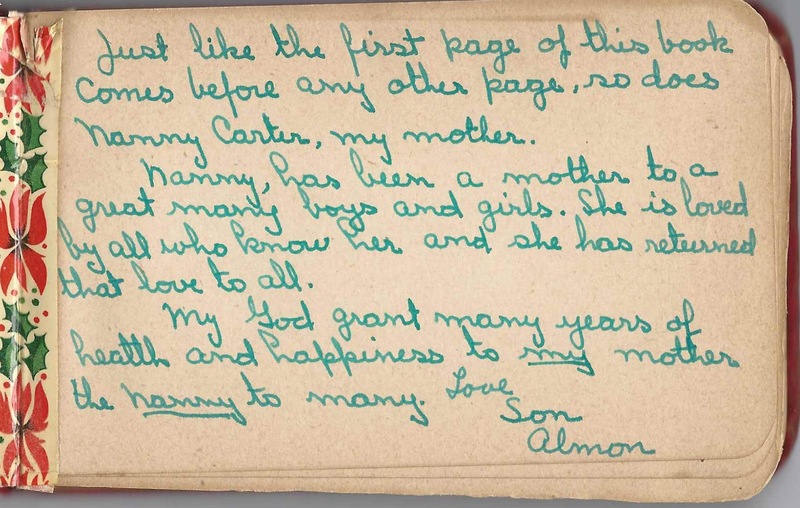 I know they had at least one child, a son Almon, who wrote lovingly of his mother, "Nanny Carter", in one of the 1954 entries. George and Lizzie lived in the highlands of Rockland near Dodges Mountain, as one of the later entries implied with a sketch. Here's Dodge Mountain Road in Rockland. Here are a few examples of the 1954 pages inscribed by people who gave only their given name. 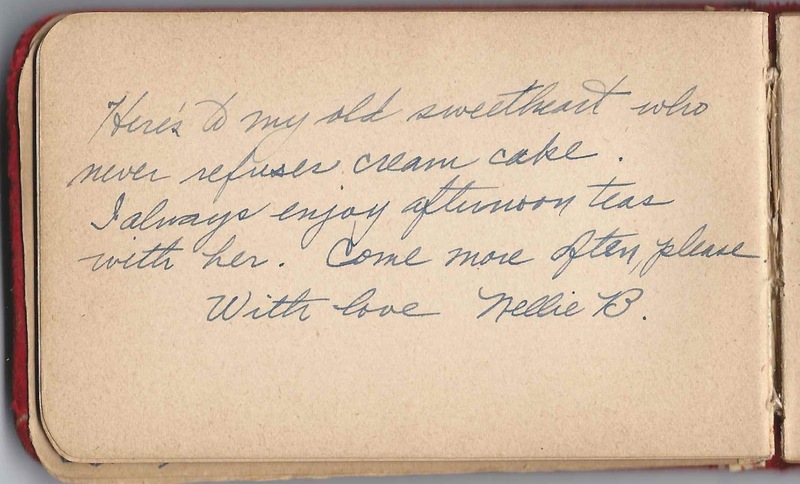 Nellie B. signed a page. Harry inscribed a page to "Aunt Tute" on March 20, 1954. 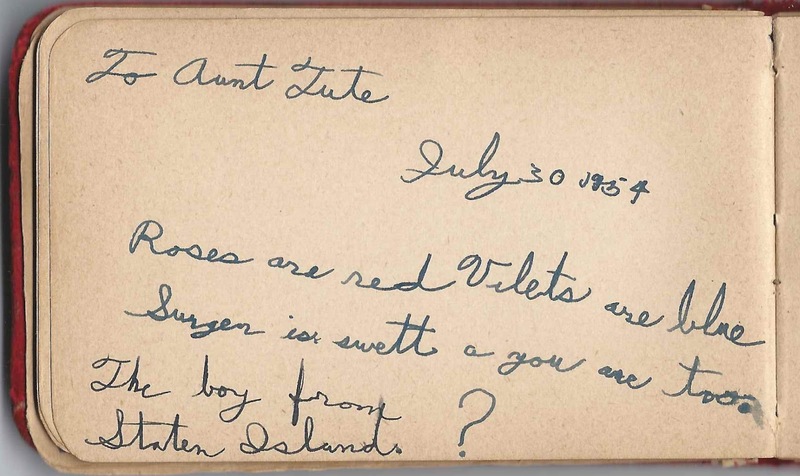 The Boy from Staten Island inscribed a page to Aunt Tute on July 30, 1954. 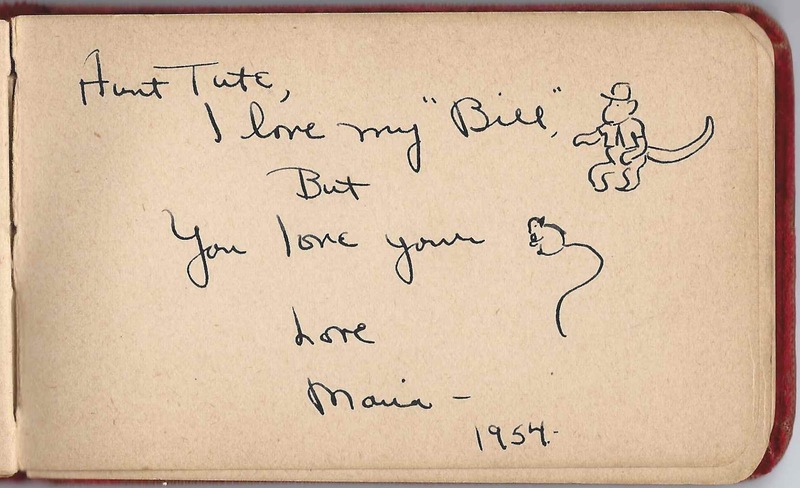 Maria signed a page in 1954. 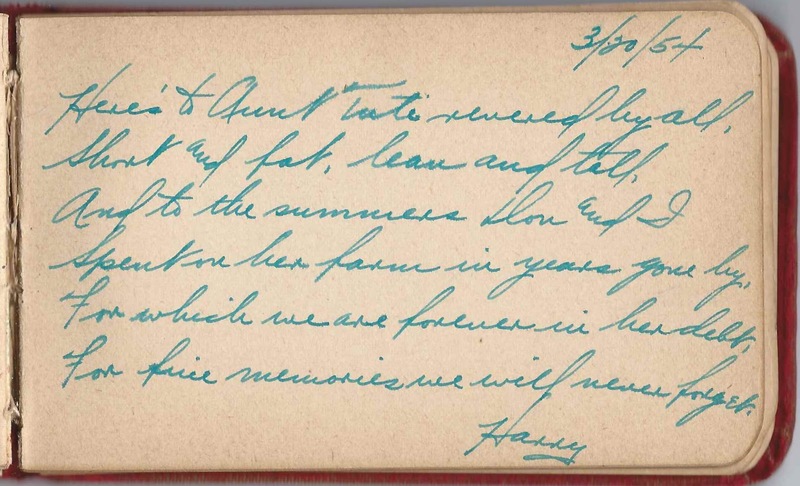 Harry, inscribed a page to Aunt Tute on March 20, 1954. Maria, signed in 1954. Inscribed to "Aunt Tute"
Don. He didn't give a last name but implied that he lived in Bath, Maine. 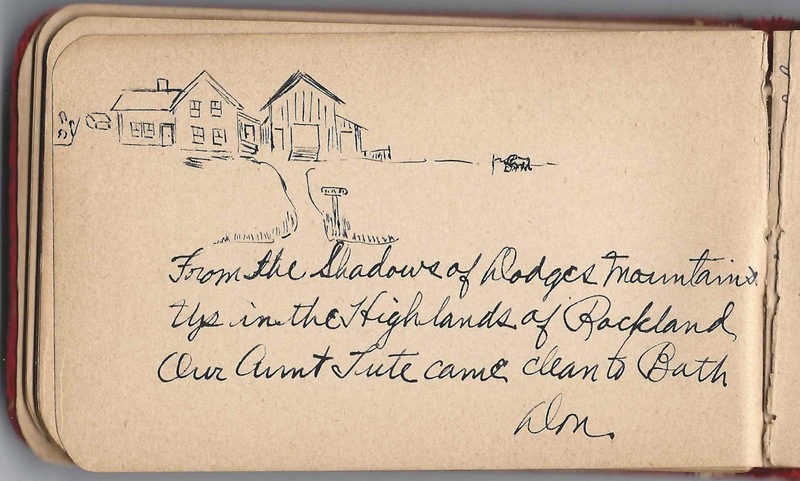 He drew a wonderful sketch of Lizzie's farm buildings at Dodge's Mountain in the "Highlands of Rockland"
Frank Beverage, signed at North Haven, Maine, on July 19, 1954. "Born 1861, January 14. 93 years old. With very best wishes. 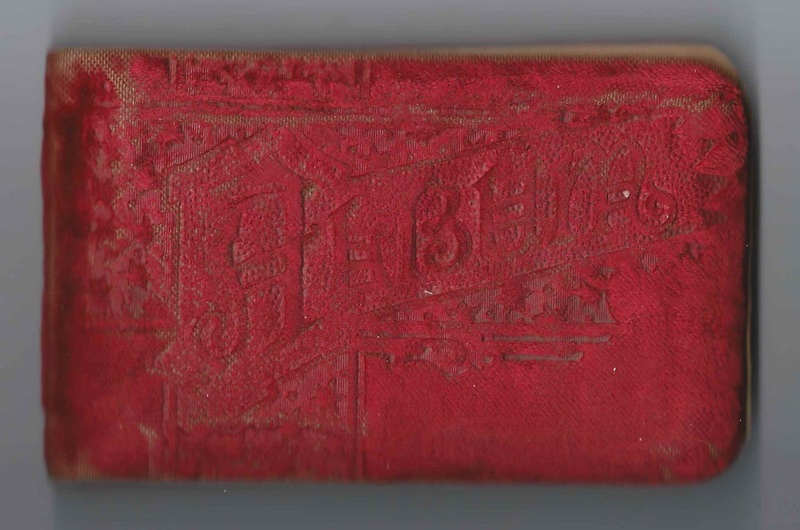 Frank Beverage"
Emma P. Goodrich of Oakland, Maine, signed at O.H.S., on September 6, 1889. Gerry S. Hayes, signed on July 31, 1954. "Toot, Toot, Here Comes Aunt Tute"
Catharine G. Hayes, to "Aunt Tute"
Blanche Hewitt, signed on January 19, 1954. Rhea W. Kimble, signed on January 19, 1954. H. Alton Lewis, signed on July 22, 1954. Ruth C. Low, signed on April 26, 1954; "your loving Granddaughter"
Bernice McGlinchey, signed on January 9, 1954 "daughter of Angie. Sincerely." Harold T. Stanton, signed on January 22, 1954; not sure of middle initial. Harold sketched a lighthouse and sailboat, with a bright sun. Yes, I believe I still have it. Contact me through Inquiries at top right margin. We've connected, and the album is headed to a descendant!